Celebrate a very special moment in Star Wars history with the introduction of the 500th figure in this legendary collection of 3 ¾ action figures. No character is more fitting to mark this significant event than the ultimate villain of all time, Darth Vader. 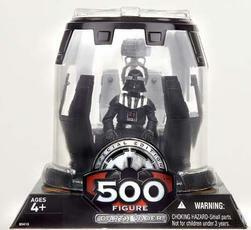 Designed with incredible detail and superior articulation, Vader comes with his famous meditation chamber where his menacing helmet is lowered onto him. The helmet can be lifted and lowered with a lever at the back of the chamber.